University of Information Technology and Communication / College of Engineering welcomes their fresh students..
University of Information Technology and Communication / College of Engineering has welcomed their newly accepted students for the year of 2018-2019. 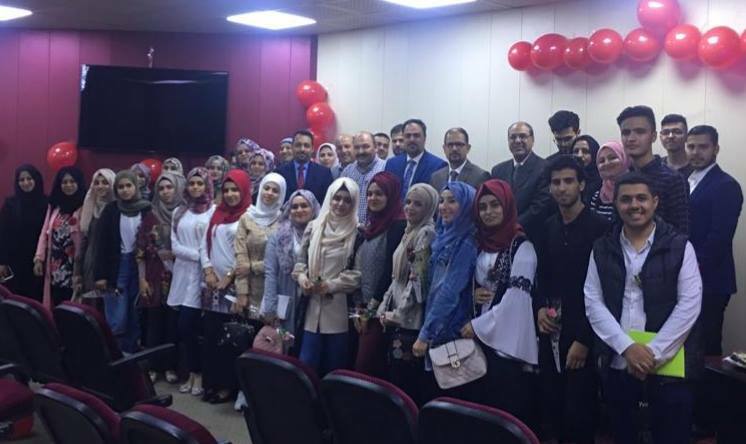 While the dean of the college and faculty has introduced the fresh students to their new departments of (Communication and Mobile Computing) and (Media Technology Engineering). The ceremony consisted of a speech of the College Dean (Asst. Prof. Dr. Moayad Abdulrida) who encouraged the students to be active and work hard and obey the daily presence in the college in order to fulfil their dreams and parents', wishing them all success and god speed. Following the Dean's speech, there were many other welcoming words and directions to follow the ministerial instruction by College of Engineering Dean's Assistant and Heads of Departments who assured that their doors are always open to all students and ready to hear their suggestions and questions. Finally, HR Manager gave away roses to the fresh students in worm and respectful environment.